Mindray is a silver sponsor of Euroanaesthesia for the second consecutive year. Mindray was proud to be a silver sponsor of Euroanaesthesia for the second consecutive year. The annual congress of the European Society of Anaesthesiology this year was held in Stockholm, Sweden between 31st May and 2nd June, which attracted more than 6000 delegates from all over the world. In recognition of the importance of this event, Mindray provided a large presence at Euroanaesthesia. The company’s striking, centrally-located booth received a stream of interested delegates from across Europe, as well as Russia, the Middle East, Africa and Asia, throughout the congress. 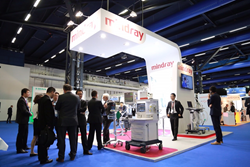 Among the technologically advanced products they came to see were Mindray’s A7 Anaesthesia Workstation and the SynoVent E5 Ventilator. The A7, which was launched at last year’s ESA Congress, features an interface for full electronic monitoring of gas flow and a unique optimiser, creating a benchmark in safety and efficacy for anaesthesia workstations. The SynoVent E5 aims at simplifying the daily work of the doctors; the modern user interface combines touch screen and direct access knob, enabling all operations to be accessed within a maximum of 2 steps. Mindray were delighted with the level of interest in the company and its products shown by the ESA delegates, as David Yin, General Manager of International Sales and Marketing System, said, “The company values all of these opportunities to meet and listen to the clinicians who are helping to define our future”.